This was my families first time staying at one of these cabins. Wasn't really sure what to expect but when we got there the cabin, view and everything else was amazing. Can't wait to go back!!! We have been repeat customers several times and enjoy the service and honestly of the company. This was the second time we have stayed with GSCR. 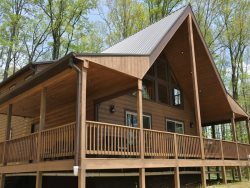 It will not be our last As beautiful as your online descriptions sound, the cabins have been even better. After staying there for a week, I can understand how words fail to describe the beauty of OWLs ROOST. And when we had a problem, not related to the cabin or rental, your employee Josh handled it in a flash with class. Most wonderful, beautiful vacation I have ever had. This cabin is gorgeous. But even better than the mountains or the icy rivers or risking life and limb in a frigid river was the great company. I took lots of pictures. We hate to have to go back to reality. We have had 6 great adventures here and can't wait to come back for more. Absolutely breathtaking!! Everything was beautiful! We will be back and we will miss JO JO! Wow, what a beautiful cabin. The Owl dcor was awesome. OMG, the porch swing was so relaxing for reading, sipping coffee & enjoying the view. The screened in porch & fireplace were a huge hit with the kids to make smores 7 other sweet treats. We loved walking the trails to the Hemlock Inn. Hiked over 20 miles with the kids and saw several beautiful waterfalls. My kids especially loved spending time with Joe the dog next door. Did I mention we saw a bobcat. It was really cool! We've been twice and have another visit scheduled. I've traveled all over the world and this is the most peaceful place I've ever been - love it! "Beyond expectations!" This is a fabulous cabin Owls Roost Cabin. Has everything you could possibly want. Spacious. Great view. Wonderful porches. Don't want to leave!